Maybe it's a cheat. If so, I'll say Abel...but I really think of them as a team...of sorts. This is definitely not from them being hosts of the DC mystery books. 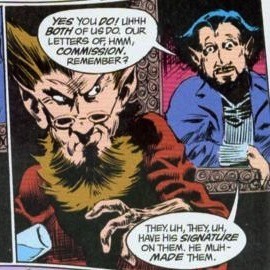 This is based on their use, predominantly by Neil Gaiman, and to a lesser extent Alan Moore and the Sandman spin-offs. 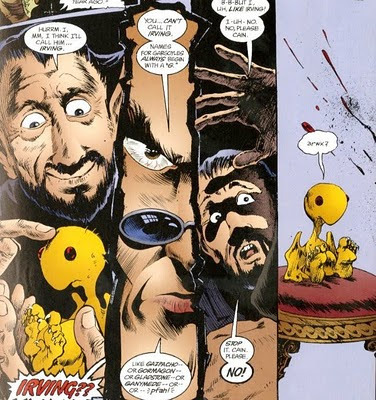 While they were used largely as comic relief in Sandman there are definitely layers to each character that are hinted at in a very nuanced way. The two are archetypes...the first victim and the first murderer...roles they play out over and over. Yet when Abel is killed by The Kindly Ones, Cain is distraught and demands that Abel be restored, as only he is allowed to murder Abel. Abel clearly loves his brother, though he has no good reason too. And he loves Goldie, the Gargoyle. They are among the first story-tellers...and theirs is among the first of all stories. Essentially, I agree. It would be like having Bert without Ernie. The pair functions as a single presence. As for a trade, black and white trades didn't sell well enough for Marvel so they would have to color those back us which would split the market among those who might be interested because of those who like classic comics but do not like modern coloring or who want it in its original format who wouldn't buy a colored reprint and the rest of the market unlikely to buy a black and white book, which means it's likely too small a seller for them to bother with. You would consider 5 ghosts horror? I would think it has alot more in common with Indiana Jones or the Shadow than anything Horror-y. Some people make a distinction between horror movies and monster movies and wouldn't consider the Universal stuff horror movies, they were monster movies. Then they get even more narrowly focused and split between monster movies and creature features. For me, if it has monsters and ghosts and various forms of undead, it's under the umbrella of horror, but I actually prefer the wider label of weird fiction that was coined from the type of stories that appeared in the Weird Tales pulps, ranging from Lovecraft to Howard to sci-fi, or whatever. But for the purposes of this particular venue that Shax is running, I would use a little narrower umbrella, but as long as they are fighting monsters and undead and such, I would call it horror, and so Five Ghosts would fall under that, especially the later part of the run. That last caption in picture 3 says it all man... the appetite for the flesh they enjoyed most...HUMAN FLESH yeah boy!!! What self respecting chubby 13 year old nerd isnt scaring themselves silly reading this man. Dinosaurs man...eatin people. EATING. PEOPLE. Im there, Im so in Im almost out. 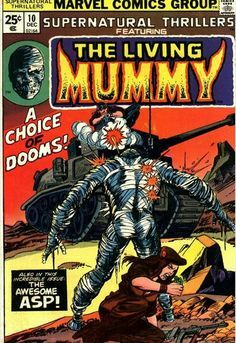 Old One Eye (and soon her son Satannus who appears in the classic Cursed Earth storyline) are just like Kong man, misunderstood for doing what they do...so unfair. 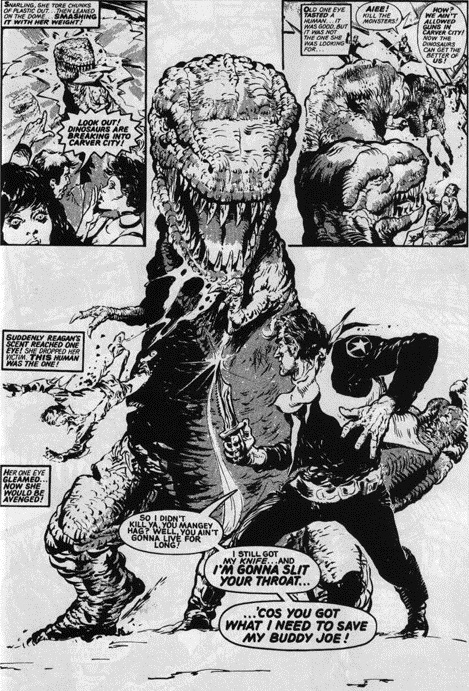 The other cool thing with this strip, and with the Cursed Earth chapters, is you see the Jurassic Park movies 20 years before they came around. So many elements are there, zoo/game reserve, dinos rampaging, and raptors...freakin raptors man. I'll line my Rexxies up gainst your [email protected] anthology hosts any day... cept Spectre man, he bad. I started buying Eerie with issue #52, so this was early in my Warren reading, and this was the first of the ongoing series in Eerie that really caught my fancy. If the image above resembles Vincent Price, that's because the whole series is a ripoff of the Dr. Phibes movies, which I hadn't and still haven't seen. In this version, Dr. Alistair Archaeus is convicted of murder and hanged, but survives and takes revenge on the 12 jurors who convicted him - using the "12 Days of Christmas" song as the inspiration for each murder in turn. The first half-dozen chapters are really well done; I looked forward to this feature when a new issue of Eerie came out. Unfortunately Dr. Archaeus didn't get to all 12 jurors - the seventh chapter is a disappointing, rushed wrapup to the series. 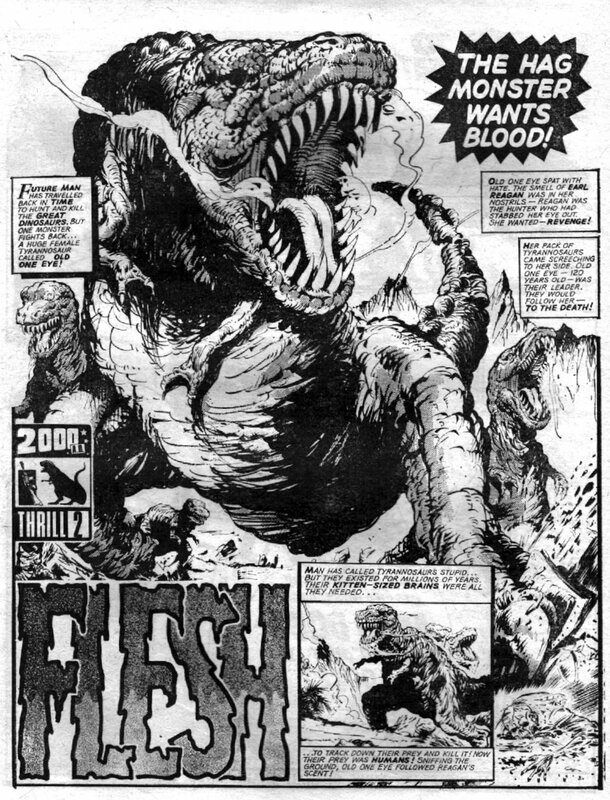 There was at least one follow-up to "Flesh" around 2008 or so, in which cattle ranchers from the future were time traveling back to capture and slaughter dinosaurs for their meat. Weird inversion of the initial premise. I've never heard of this but I love the Abominable Dr. Phibes and Dr. Phibes rises Again are two of my favorite Price films so I need to track this one down for sure. This run from Supernatural Thrillers is great in my opinion. You get covers from Brunner, Romita and Kane over the 10 issues or so that he was featured in the series (Kane's covers being my favourite). Gerber did the first few stories, before Tony Isabella took over most of the primary stories. 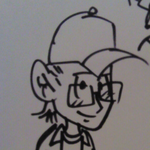 I know Isabella did work on Ghost Rider, of which I have not read, and other Marvel titles. I do not know what ranks as his best stuff but for me, this is worth the read, if not for the artwork alone. My two favourite covers are below. I loved him in the Legion of Monsters book that Marvel put out a few years back but I never read the original. This run from Supernatural Thrillers is great in my opinion. You get covers from Brunner, Romita and Kane over the 10 issues or so that he was featured in the series (Kane's covers being my favourite). Mate, this cover is just awesome, one of the reasons you could argue for Gil Kane as the best cover artists of all, always so dynamic.